Where's My Billy Goat Gone To? Henry Clay Work was a 19th century American writer of poetry who is best remembered for the composition of many stirring, often religiously themed songs and music. He had a remarkable talent for composing music in his head, without the aid of a piano, a skill that came from his time working in a print shop in Chicago. He used the rhythm of the machinery to inspire him in his art. He was born on the 1st October 1832 in a Connecticut town called Middletown. His family were Unionists and active opponents of slavery. Their home was a part of the “underground railroad” of safe houses, a network of homes where runaway slaves could shelter while fleeing northwards to Canada. Work’s father was imprisoned on one occasion for his actions. He grew up with strong musical inclinations having taught himself the rudimentary skills and, in his early twenties, he worked on the process of setting musical type at premises in Chicago. His reference above to “darkeys” was not made in a derogatory fashion. 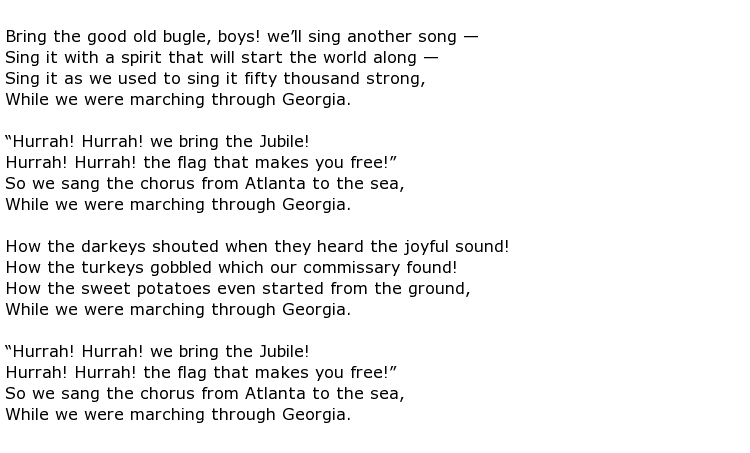 He merely used the word to describe the negroes in the battalion and, indeed, he often incorporated elements of their particular way of speaking into some of his poems and songs. His 1862 song Kingdom Coming included slave dialect and he also added the odd bit of Irish-speak to his work where it was appropriate. While such verse was popular at the time it would be less favourably viewed today. Nevertheless, this song was used as late as 1944 when it was heard being sung in the background during the film Meet Me in St Louis, starring Judy Garland. It was a natural progression that his work should be incorporated into the minstrels shows, a genre of musical entertainment that spanned the 19th and 20th centuries which was very popular in the early days but viewed as slightly controversial later on. The concept of “happy slaves” singing about their lives soon lost its appeal as the abolitionist movement took hold but it is a fact that the idea survived well into the middle decades of the 20th century, thanks in no small part to the writing skills of men like Henry Clay Work. His post-war work was less successful and some have blamed his unhappy domestic life for that. His marriage was struggling and this will, no doubt, have had an effect on his writing output. He wrote many poems and at least 75 of these were set to music, becoming popular songs. He lived and worked in New York City for a short period before his untimely death. 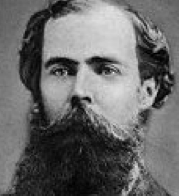 Henry Clay Work died in Hartford, Connecticut on the 8th June 1884 at the age of 51.